Nina Dubrovskaya and Lena Priyenko walk home to their village from Ivankiv, Ukraine, 2 miles away. The women, both divorcees, went out in search of company, but found all 4 bars empty. "When the money gets short, people just get drunk at home," says Dubrovskaya. 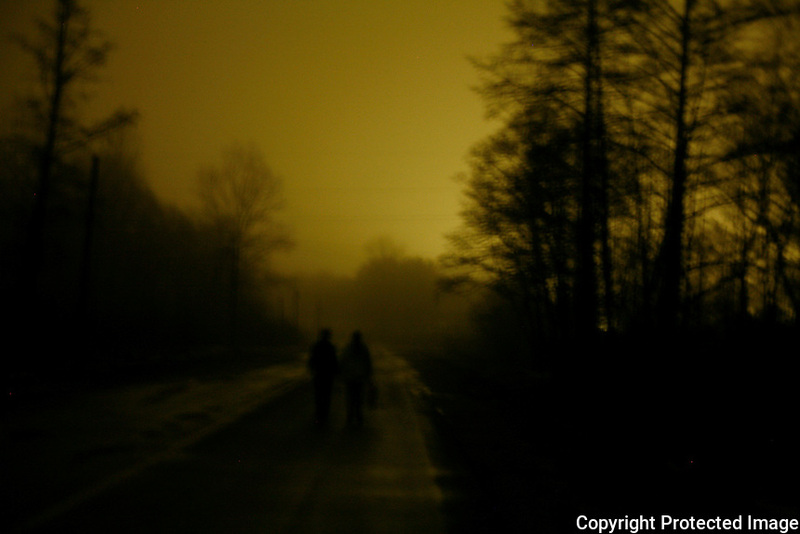 Original caption: .Late on a long winter's night, Nina Dubrovskaya and her friend Lena Priyenko walk home to their village Sukachi, Ukraine, from the nearby town of Ivankiv, 2 miles away. The two women, both divorcees, went out to the bars in Ivankiv in search of company, but found all 4 bars they visited nearly empty. "When the money gets short, people just get drunk at home," says Dubrovskaya. .